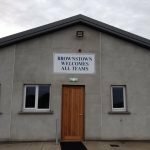 Brownstown Community Centre is located in Archerstown, Delvin – a short drive from the village. The centre has benefited from significant investment over the last few years thanks to the fundraising efforts of the volunteers that manage and maintain the facility. A host of weekly activities take place at the centre, including badminton, circuit training and indoor soccer. An annual variety show also takes place, with preparations commencing in autumn each year. The venue comes equipped with full kitchen facilities and a large selection of tables and chairs. Bouncy castles and inflatable assault courses are also available in house and stage facilities can be provided on request.